The fast, easy and seamless integration of external enterprise data sources is a common requirement in the use of Microsoft SharePoint technology. existing out-of-the-box solutions, such as the Business Connectivity Services (BCS), are often complex at the facility, require additional tools or programming, have serious limitations or are available for certain SharePoint editions only. Data is surfaced in SharePoint - but not well integrated. The Layer2 Business Data List Connector for SharePoint completely seems to solves those issues. You simply have to click "Connect to External Data Source"in your list settings. 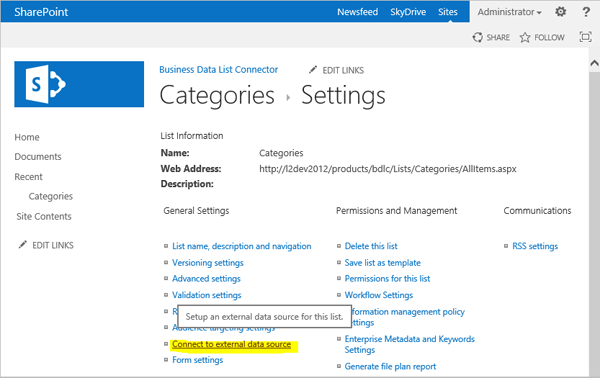 No additional tools or programming required: The connection can be configured easily directly in the SharePoint list settings with a few configuration settings only. Every SharePoint admin can do this in a few minutes. Connected data always up-to-date: The connected data updates automatically in background (via timer job) or alternatively on-demand (Action Menu / Ribbon Button, URL, workflow, API). Changed data is transferred only. Optional bi-directional connection: Write-back of changes made in SharePoint to external data sources automatically with full CRUD (Create / Update / Delete). All existing ODBC, OLEDB, OData and .NET based 3rd party ADO.NET data providers are supported: You can connect to SQL Server, SQL Azure, MySQL, Exchange, Active Directory, SharePoint, MS Office Excel, Access or CSV text files, XML, EDI, Oracle, IBM DB2, Informix, AS400, Cache, ERP/CRM systems e.g. MS Dynamics CRM / NAV / AX, SAP, Salesforce.com, Twitter, Google, Facebook, QuickBooks, Peachtree, HL7, Virtual Store, general Web Services, .NET or COM+ objects and many others. Additional data provider included: SharePoint 2007 / 2010 and 2013 (CSOM, on-premise and cloud-based), OData (e.g. MS CRM), XML (file or web request), RSS. Known BCS issues and limitations are completely solved: All list features available now. Views, sorting and grouping, filters, calculated fields, search, enterprise metadata, lookups can be created as usual. Workflows and notifications on external change: List workflows (SPD-, VS- and Nintex-based) and change notifications per RSS or email can be used to take business actions in SharePoint, if external business data records are changed. High Security: SharePoint 2010 Secure Store can be used to store security relevant information. All list types are supported: Contacts, tasks, events, custom lists etc. You can take the external data offline via Outlook and / or Workspace. You can add additional SharePoint-only columns or attachments to the the external data: Documents, comments, ratings, enterprise metadata, or other Web 2.0 content. Application logging, reporting and notifications: SharePoint lists are used to store settings and log information. SharePoint item versioning and workflows can be used to manage reporting and notifications. Direct notification per email in case of errors supported as well. Easy SharePoint migration from SharePoint 2007 to 2010 and 2013: All settings are kept working. Free upgrade for all customers with Software Assurance (SA). The component is offered for SharePoint 2007, 2010, 2013, 2016 all editions. The download is free after registration.